Although Tallis just described James Fergusson as Esquire, he was much more than just a gentleman retired from active business. He was heavily involved in various building committees and the history of architecture on which he wrote several books. I have therefore given him the occupation of ‘architect’, although he was not a practising architect as such. Fergusson had made his money in India as an indigo planter, but sold up in 1840 or thereabouts and came back to England. 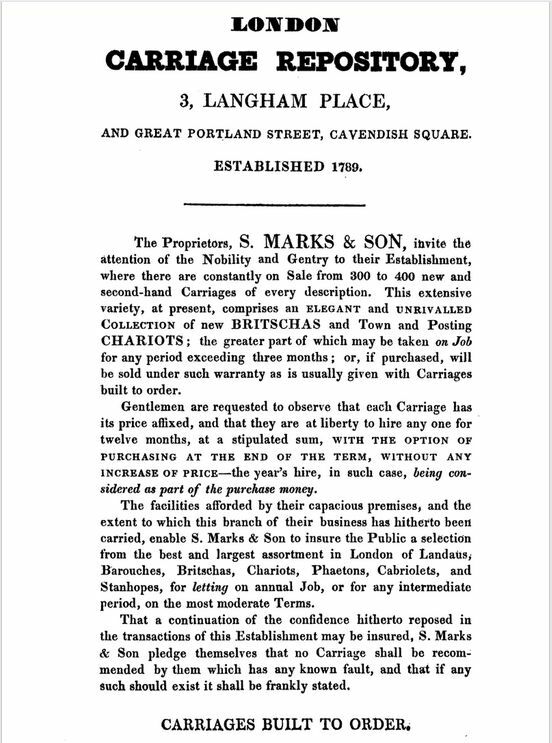 In June 1842, he acquired the leases of four properties in Langham Place(1) and proceeded to build a block of houses to his specifications on what had been the front of Marks’ coach repository. 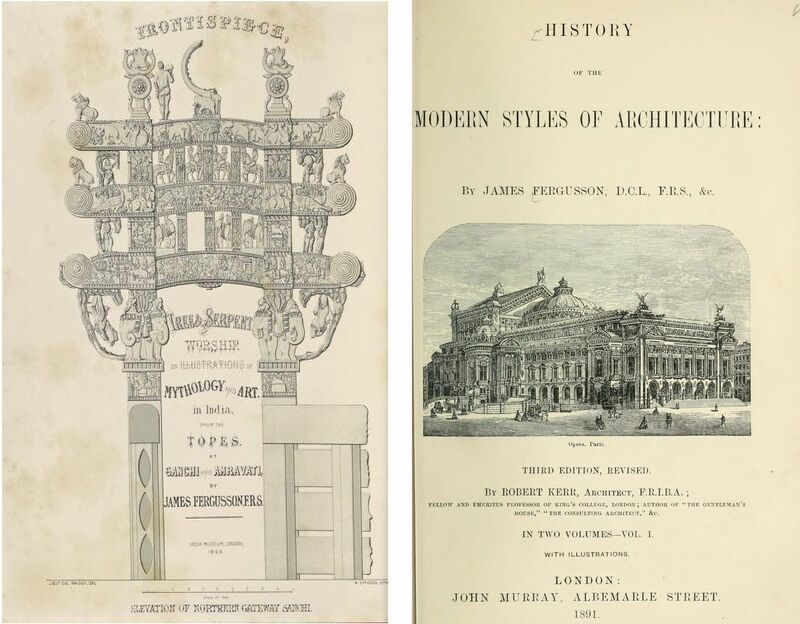 Henry Stacy Marks, in his Pen and Pencil Sketches of 1894 wrote “the old premises were sold to Mr. Fergusson the architect, who had them entirely rebuilt and reconstructed”. “The Langham Place frontage was displaced by a new row of handsome houses … in the centre of which was an entrance to the new business premises, entirely remodelled, and if less picturesque, more convenient”. 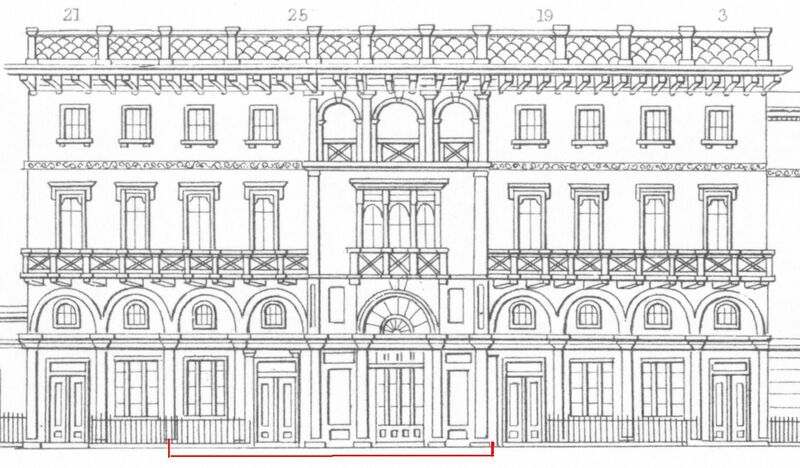 Fergusson used number 20 (mistakenly numbered 25 by Tallis) as his own residence, which was larger than numbers 3, 19 and 21 as he also had the section above the new entrance to Marks’ coach repository (see illustration below; red line under Fergusson’s residence). See for the illogical numbering of the houses the post on Alfred Markwick who occupied number 19, and for the changes to the coach repository the post on Marks & Co. The houses were not designed by Fergusson himself, but by David Mocatta. A sketch of the plan is held in the RIBA collection. The third edition of Fergusson’s The History of Architecture was published after his death and included a ‘Sketch of his Life’ by William H. White, who said that Fergusson had always intended to come home from India as soon as possible and that “having known the pleasures as well as the discomforts of a planter’s life, he kept a tolerable stable”, whatever that is supposed to mean. He was certainly in England in 1841 when the census was taken and then living with his parents in New Windsor, Berkshire. According to White, he returned to India several times in the period 1843-1845 for lengthy tours that culminated in several books. But when he came back from these tours, it was to live at Langham Place for the rest of his life. In 1851, his mother, his sister and a niece were living (or just staying?) with him, but in later censuses, he is found on his own with just two servants. Lots has been written about Fergusson himself and the books he wrote, so I will not repeat all that, but suggest two websites with more information: Clan Ferguson and The Victorian Web. Fergusson died in January 1886(2) and the leases of Hayne’s Livery Stable (behind number 21), of the Portland Bazaar (behind number 20), and of 20 and 21 Langham Place themselves were acquired by Francis Ravenscroft who agreed with the Crown for the building of a concert hall, designed by Thomas Edward Knightley. (3) The hall became known as Queen’s Hall and was from 1895 until 1941 the home of ‘The Proms’, the promenade concerts founded by Robert Newman, the Hall’s manager, and conductor Henry Wood. The Hall stood proudly on the extensive corner plot until May 1941 when the fire caused by a German incendiary bomb destroyed it completely. Photograph copied from Robert Elkin, Queen’s Hall 1893-1941, 1944. 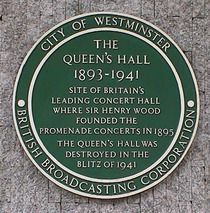 More information about the end of Queen’s Hall can be found on the West End at War website, and more about the Hall itself on the Wikipedia page. All that now remains is a green plaque. (1) Appendix no. 1 of the Twentieth Report of the Commissioners of her Majesty’s Wood, Forests, Land Revenues, Works and Buildings, 21 August 1843. (2) England & Wales, National Probate Calendar (Index of Wills and Administrations), 1886. The estate was valued at just under £43,000. (3) Robert Elkin, Queen’s Hall 1893-1941, 1944, pp. 14-15. Street View: 16 and 5 Suppl. The coach and harness business of John Isaac Marks at Langham Place was situated on the site of the former riding house of the Horse Grenadier Guards, hence the name of the street between Marks’s building and All Souls Church: Riding House Lane (now Street). The stables and barracks of the First Troop of the Horse Guards had been built in 1726 on what was then open ground. The First Troop became the First Regiment of Life Guards in 1788 and the buildings were adapted for use as livery stables and a coach repository. 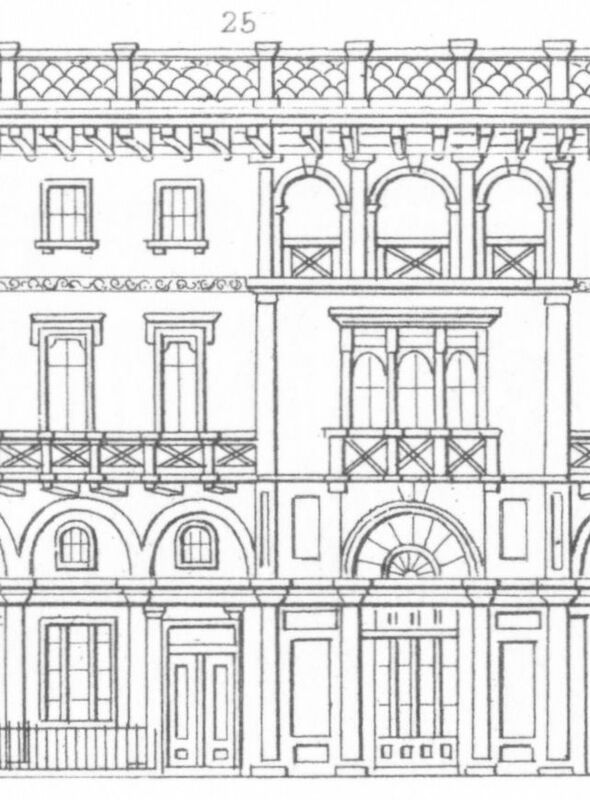 When John Nash was redeveloping Regent Street, he agreed with John Marks (John Isaac’s father) that a new frontage on the Langham Place side would be created at the expense of the Crown. It was only to be used as a pedestrian entrance and for showcasing the coaches. The new building was ready to be opened in 1824. 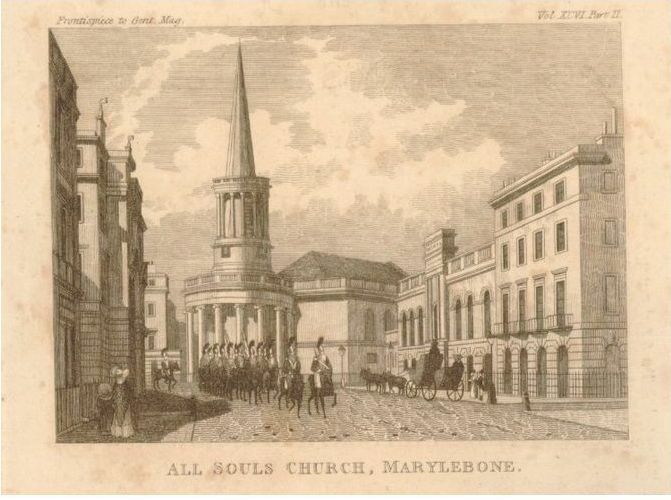 It was quite an impressive front for Marks’s business and when The Gentleman’s Magazine of July 1826 reported on the recently consecrated church of All Souls, a frontispiece was included which not only showed the church, but also the coach repository (on the right, behind the coach and horses). The buildings at the back around the yard were two stories high, with storerooms and standing places for carriages on the ground floor and galleries above for the display of carriages. In one corner of the building a crane could be found for raising the carriages. Various workshops were also found upstairs, such as those of the body and harness makers. (1) But, as we already saw in the post on Alfred Markwick, the frontage of the coach repository at number 3 did not dominate Langham Place for very long. 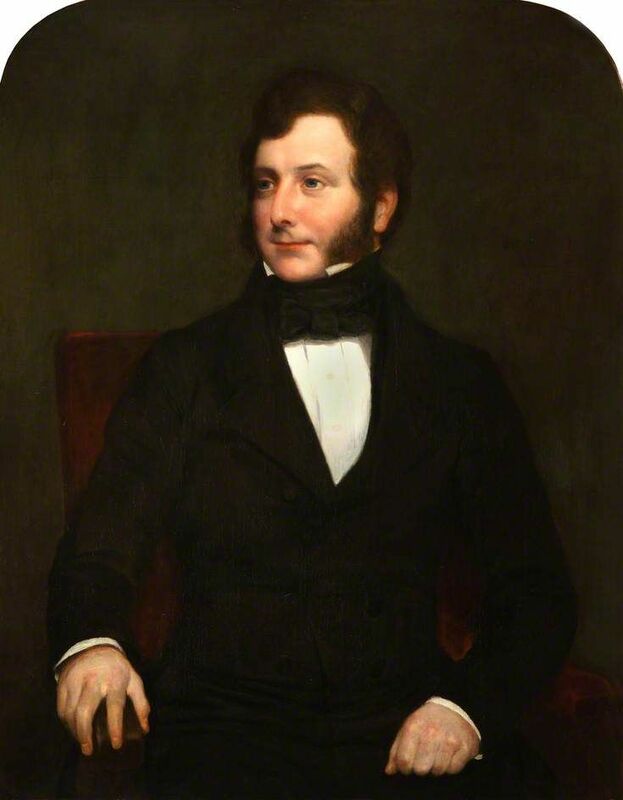 James Fergusson who had made his fortune in India as an indigo planter, took over the lease and had four houses built in Langham Place in 1842. The coach depository was rebuilt at the back with the entrance leading to Marks’s business on the ground floor next to the new number 20 where Fergusson was to live until his death in 1886. Tallis was not quite sure what to do with the numbering and in the index to his Supplement, he lists Marks at number 19, although that was the house number of neighbour Markwick. The upper floors above Marks’s entrance were part of Fergusson’s house. Henry Stacy Marks, in his Pen and Pencil Sketches of 1894, wrote that the business became known as the London Coach Repository and concentrated more and more on selling coaches from other makers on commission. In 1851, Marks sold out to one William Walker, who redeveloped the coach repository into the Langham Bazaar, later to be renamed the Portland Bazaar. It was not a great success and in 1862 the buildings were acquired by the Prince of Wales’ Hall & Club Company for redevelopment as a hall for musical entertainments. Before anything could be done, however, the bazaar was destroyed by fire and it took till 1867 before the southern half of the former bazaar had been rebuilt as a music hall. It was named St. George’s Hall and had a new main entrance at 19 Langham Place. So, what do we know of the Marks family who ran the coach repository? The one who sold out to Walker in 1851 was John Isaac Marks. In the 1851 census we find him as a coach maker in Mornington Road. One of his children living with him was Henry Stacy whose occupation is given as a portrait painter. He had been destined to work in the family business and when his drawing and painting skills became apparent, he was set to paint the crests and coats of arms on the coaches. His commercial acumen, however, left much to be desired, and he went on to study art rather than take over the business. In his later reminiscences, he said that the business was “always irksome, never enlisted my energy or liking”. This may very well have been a contributing factor in John Isaac’s decision to terminate the business at Langham Place, although Henry Stacy contributed the closure to the fact that his father “had not the faculty for business”. Henry Stacy’s second name was derived from his great-grandfather Isaac Stacy, whose daughter Sarah had married John Marks in 1801. When John Marks died in 1828, a bit of bother occurred as one of the sons, James, that is, John Isaac’s brother, did not fulfil the requirements set out in his father’s will for attaining a fourth share in the business. (2) He had not worked the full term of his apprenticeship, but had set up on his own – unsuccessfully – as a horse dealer. He went bankrupt and Sarah and John Isaac were summoned to disclose the books of the Marks business. They refused on the grounds that James had nothing to do with the business and had shown no interest in it, but under John’s will James still had a financial interest in the business between the age of 21 and the bankruptcy, so it was ruled that Sarah & Co had to disclose the books, but that it would be done in private. You can read the transcript of the case here. The advertisement above from The Edinburgh Review of 1831 shows how extensive the business was. They had 300 to 400 carriages on show and it is no wonder that their premises at the back of Langham Place were large enough to accommodate the later Portland Bazaar. 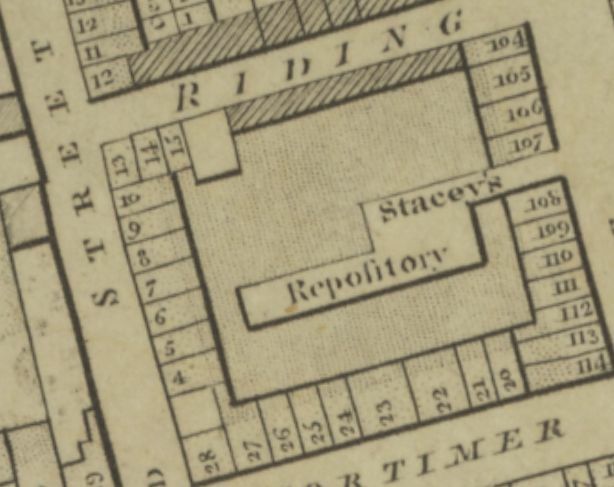 If we work backwards, we can see that Marks took over from Stacy’s Repository which was already depicted in Horwood’s 1799 map. Yes indeed, that was the property of Isaac Stacy whom we met above as the father of Sarah Stacy, the wife of John Marks. In other words, Marks took over the business of his father-in-law who had died in 1803. What was to become Langham Place was still called Edward Street in 1799 when Horwood produced his map, but Mortimer Street and Riding House Lane are clear markers for the position of the coach business. According to the 1831 advertisement shown above, Stacy had started the business in 1789, but it was probably a few years earlier. We already find advertisements in 1785 for a Mr. Stacy, (coach) painter, in Riding House Lane who deals in carriages. Although no first name or initials are given, it was most likely Isaac who started out as coach painter and expanded his business after the Horse Guards left into the repository, calling himself in his will a “coach broker”. (3) At some point (at least since 1790) Isaac subleased the livery stables to one Roger Hayne, but he kept the coach repository as his own line of business. 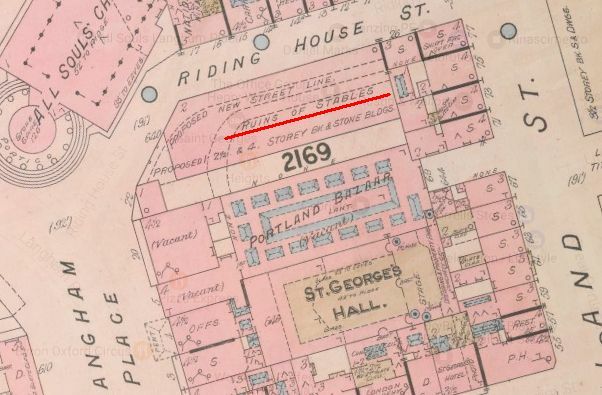 Hayne’s stables were situated on the north side, the Riding House Street side, marked on Goad’s insurance map as “ruins of stables” (underlined in red). The middle section of the land was the northern part of Stacy’s and Marks’s depository and became the Portland Bazaar; the southern section of the depository became George’s Hall. When Marks gave up on his coach repository in 1851 and removed himself to 140 Holborn(4), he left us a useful invention that considerably reduced the noise of the carriages, as described in The Northern Star and National Trades Journal of 27 July 1850, although Thomas Hancock and Charles Goodyear may have had something to say about that claim, see here. (1) Henry Stacy Marks, Pen and Pencil Sketches, 1894. (4) Old Bailey case t18530815-848. Street View: 5 Suppl. and 18 Suppl. 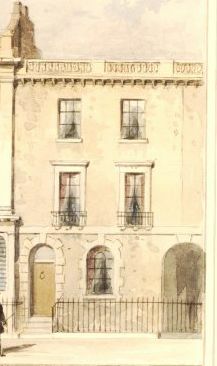 19 Langham Place only appears in the 1847 Supplement to Tallis’s Street View. If you look at the street view itself, the building of which number 19 was a part seemed to consist of four non-consecutive house numbers: 3, 19, 25, and 21, but in the index to the Supplement, the numbering is slightly more consistent: 3, 19, 20 and 21. The number 25 on the street view must have been a mistake. 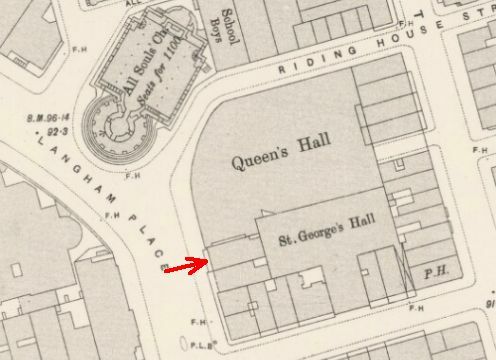 If we look back to the original street view of 1839 for Langham Place we see that the building of which number 19 was a part, did not yet exist. The space was completely covered by number 3, the ‘London Carriage Repository’ of Marks and Son. You can read about them in another post (here), but first Alfred Markwick, surgeon, whose place of business was erected in 1842 at the instigation of James Fergusson, Esq. 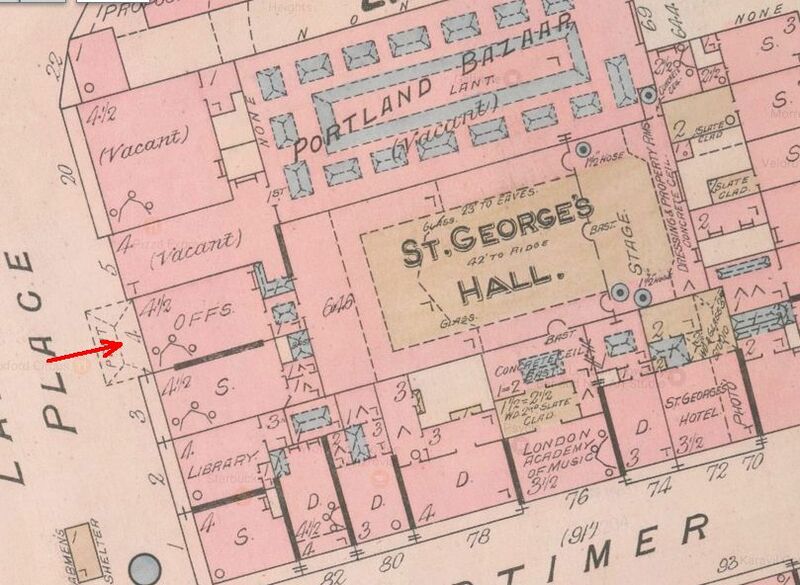 On Goad’s insurance map of 1889 we can see that another renumbering has taken place and what was number 19 is indicated as number 4, but number 20 is still number 20. Number 4 was used as the entrance to St. George’s Hall which was built in 1867 behind what was once Markwick’s place of business. In the 1890s, numbers 20 and 21 were demolished for Queen’s Hall, which extended with a rounded front into Riding House Street. The entrance to St. George’s Hall was moved to Mortimer Street. The houses that were numbered 3, 19-21 in Tallis, St. George’s Hall, and Queen’s Hall no longer exist as they fell victims to an air raid in 1941. 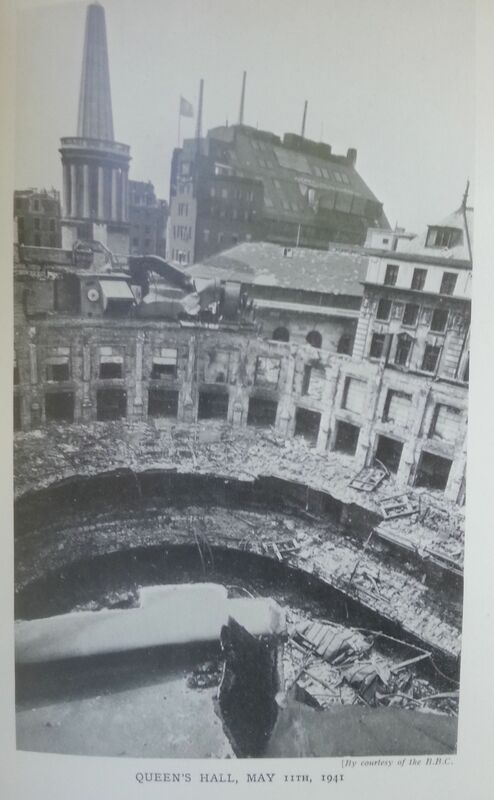 The ruins were demolished in 1952 to be replaced by the concrete Henry Wood House, which has been given the more logical numbering of Langham Place 3-7. But Langham Place was not the only address with which Markwick was associated. 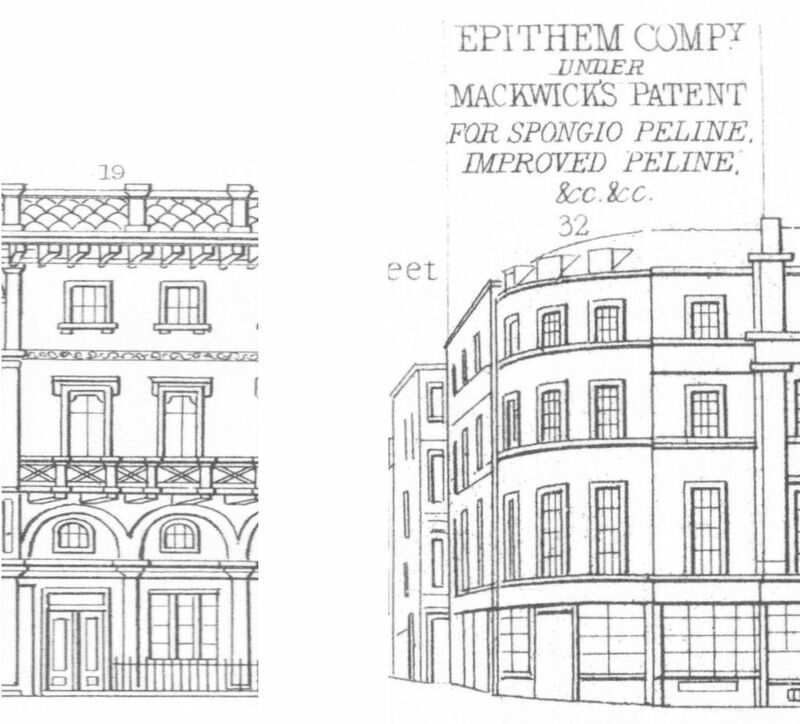 He and his father Mark were involved in the Patent Epithem Company at 69 (in 1847: 32), King William Street. They shared number 32 with Nicholls & Pellatt, the wine merchants. You can see the two Markwick properties in the elevations above this post (click to enlarge). Markwick had developed a pad to replace the old poultices filled with bran. 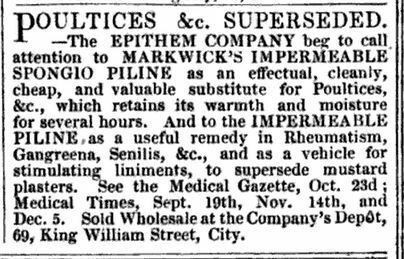 They were called Markwick’s spongio piline epithems, a name a journalist of The Era dismissed as “calculated to throw an unmerited taint of humbug and professional quackery about it, and one which few people will tax their memory to retain”. (1) Despite the dismissal of the name, the journalist accepted the fact that the pads themselves contained heat a lot longer than the traditional poultices and would not go putrid or hard and dry. They were made of sponge and wool with a backing of India rubber and very beneficial in cases of “rheumatism, sore-throat, tic-douloureaux, &c.” There was also a form without the sponge for protection of the chest. 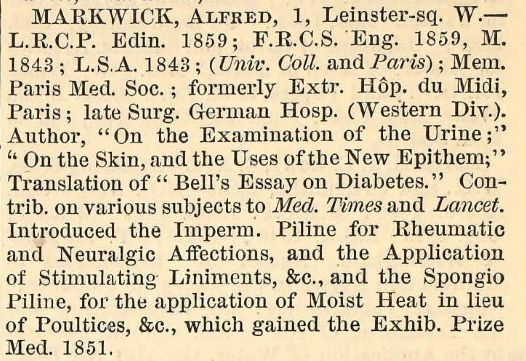 From an article in The Lancet (1846) on the epithems we learn that Markwick was surgeon to the Western German Dispensary and formerly an externe to the Venereal Hospital in Paris. (1) The Era, 18 October 1846. (2) The Era, 20 August 1848. (3) Official and Descriptive Catalogue of the Great Exhibition, 1851, Class 4: Vegetable and Animal Substances. (4) The English Reports, Volume XV Privy Council, 1901, pp. 116-118. 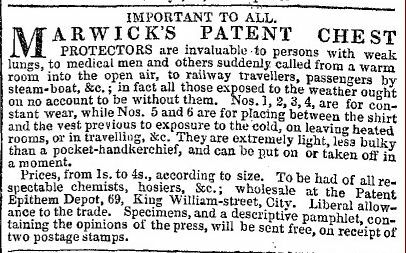 The London Gazette, 11 May 1860. (6) England & Wales, National Probate Calendar (Index of Wills and Administrations), 1887. His estate was valued at over £17,800. 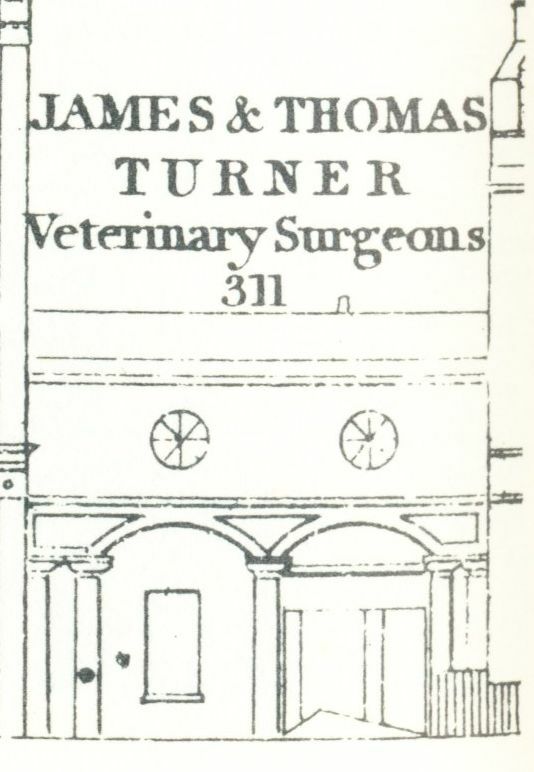 The elevation depicted above for 311 Regent Street clearly shows that the premises were occupied by brothers Thomas and James Turner, veterinary surgeons; we can easily imagine horses in need of treatment going through the stable door on the right, but the frontage does not look as if anyone, other than perhaps a stable boy, lived on the premises. A drawing by Thomas Hosmer Shepherd, dated 1843, however, clearly shows a ‘proper’ house on the same spot and from other depictions of the property, we can surmise a major building conversion somewhere between 1839, when Tallis produced his Street View, and 1843. 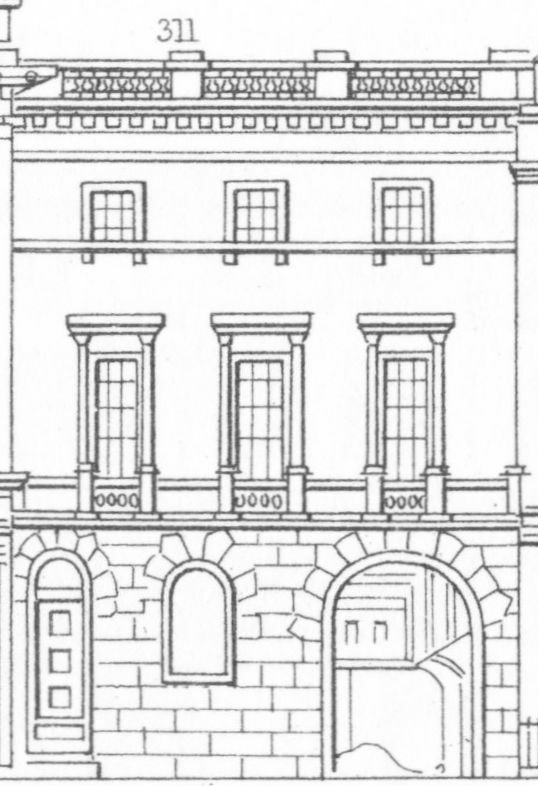 Two more illustrations of the building show a similar view to the drawing by Shepherd, although he seems to have miscounted or misremembered the number of windows upstairs. 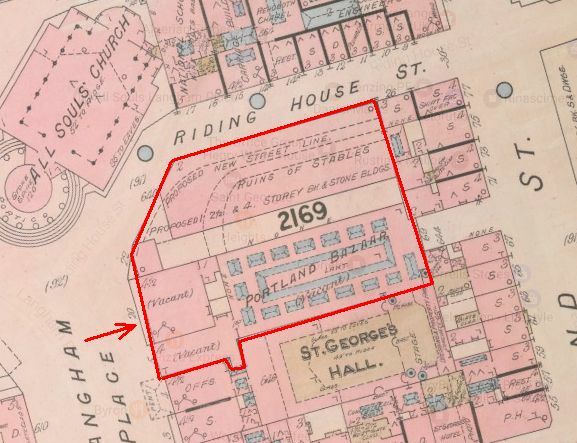 On the other side of number 309, the building of the Polytechnic Institute, more stables can be seen and although Tallis does not name the proprietors for those, it has been suggested that they were part of the Turner establishment, frequently referred to as ‘the horse infirmary’. (1) The 1839 Street View clearly shows the Polytechic building separating the two part of the stables and that is still the case in the 1847 Street View, although by then, the house had been built at number 311. If one is to turn to the 1849 Grand Panorama, however, the Polytechnic Institute is twice as large and the stables on the left have shrunk accordingly. James, according to the 1851 census, was born ±1793 in Croydon, but that is about all we know about the first part of his life. We first hear from him as a vet in The Veterinarian, a Monthly Journal of Veterinary Science in which he writes short items on the treatment of horses’ feet. 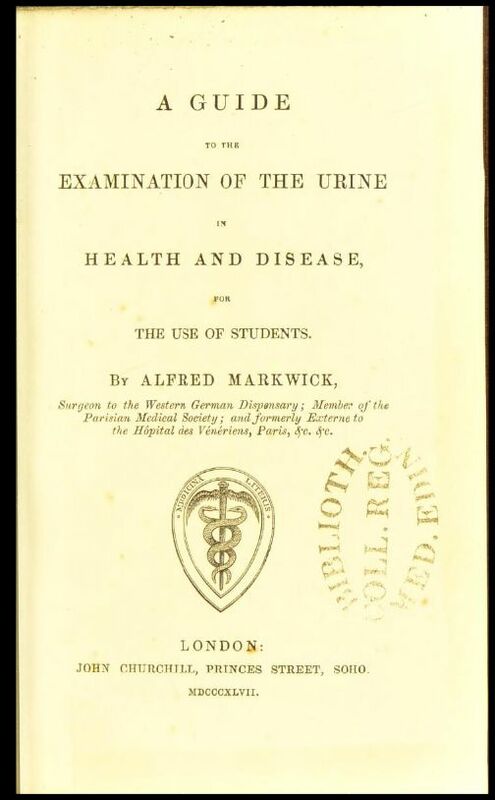 These articles were brought together in 1832 as A Treatise on the Foot of the Horse, and a New System of Shoeing by one-sided Nailing; and on the Nature, Origin, and Symptoms of the Navicular Joint Lameness, with Preventative and Curative Treatment. From the title-page, we learn that James is a Member of the Royal Veterinary College, and Veterinary Surgeon in the Army. Turner explains that Navicular Joint Lameness used to be called Coffin Lameness and that the subject had interested him since 1816 when he submitted some notes on the subject to the College. Should you wish, you can read Turner’s whole book online here. 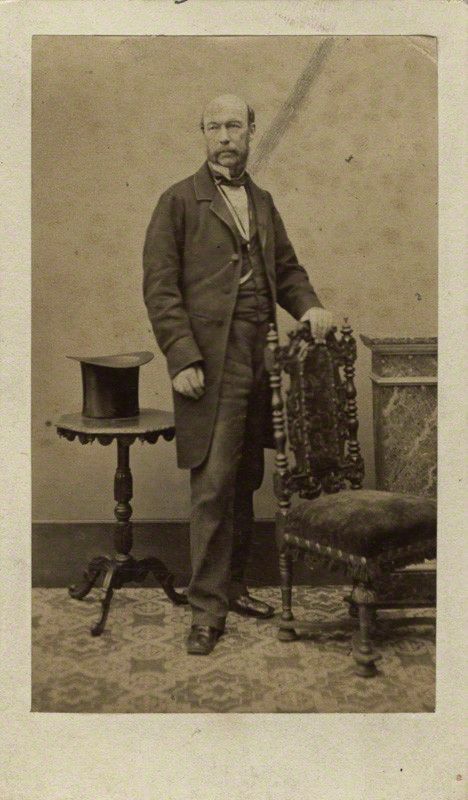 According to The Veterinarian (1832, p. 455), “there can be no dispute, that Mr. James Turner was the first person who directed the attention of veterinary practitioners to the navicular joint disease as the most frequent seat of groggy lameness”. James’s knowledge of horses made him an ideal ‘expert witness’ to be called in when litigation involved the condition of a horse, such as Baldwin v. Dixon where the horse appeared to have a lameness which did not seem to get any better(3) or Hutton v. Boorer, although it that case, the vets called in to examine the horse could not agree on whether it was lame or not. (4) The Veterinarian of 1843 reprinted An Essay on the Condition of Horses by James Turner which he had apparently written twenty years earlier. The Era of 12 February, 1843, devoted almost a whole column about that particular volume of the journal, mentioning Turner’s essay and calling it “usefull for all to peruse who dabble in horse-flesh”. Apparently horse dealers were often accused of selling diseased horses and were hence often forced to pay compensation to disgruntled customers. Turner claims that blaming the dealer was often based on a pre-conception as it was quite possible for a healthy horse to fall ill of lung trouble and die within a week. On dissection, the lungs would appear rotten suggesting bad practise on the dealer’s part, but that need not be the case as, according to Turner, lung tissue affected by inflammation deteriorated quickly. These are just a few examples of the work done by James Turner, but numerous other examples can be found in the newspapers and journals. What surprised me was that he seemed to have fully specialised in horses. No other animal seemed to have crossed his door or warranted his opinion. But perhaps I should not really be surprised given the number of horses around in those days. Although Thomas does not seem to have contributed to the veterinary discourse in the same way as James did with his articles, he did a lot for the professionalization of veterinary practitioners. 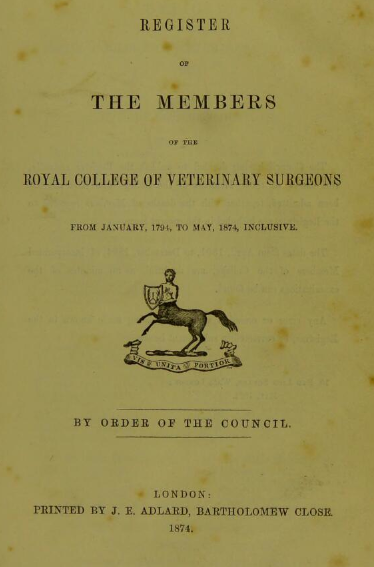 His claim to fame came about in 1844 when he became the first President of the newly incorporated Royal College of Veterinary Surgeons. He had been the driving force behind the application for a Royal Charter which was granted and sealed on 8 March 1844 and his first action in his new role was to call a General Meeting of the members. (6) Thomas remained the President till 1851 and in 1857, brother James was chosen to lead the College. Unfortunately, the brothers died quite soon after James’s spell as President. Thomas died 19 December 1859 and James a few months later on 3 April 1860. (7) What happened to the horse infirmary in Regent Street is unclear. (1) Hermione Hobhouse, A History of Regent Street: A Mile of Style (2008), p. 58. (2) Letter to the editor in The Lancet, vol. 2, p. 843-844, dated 14 August 1830. 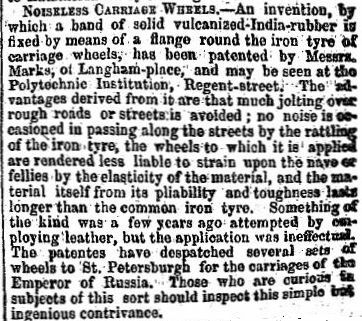 (3) The Times, 17 February 1831. (4) The Morning Chronicle, 23 February 1833. (5) Thomas (1828), Mary (1831), Fanny (1832), James (1834), William (1838). (6) Read more on the Charter on the RCVS webpage here. (7) England & Wales, National Probate Calendar (Index of Wills and Administrations), 1860 for both James and Thomas. Thomas named his wife and James as his executors and the surviving executor of James’s will was William Walter, no doubt a relation of his sister-in-law Mary Jane.